Key practice: Midday herbicide applications are most effective for canola; midnight application for grassy weeds. Any reduction in herbicide efficacy quickly impacts the return on input investment. 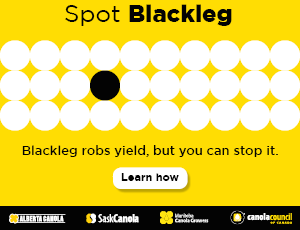 With the short Prairie growing season, canola has to be seeded and sprayed in a short window, and timing is critical to optimum performance. This study shows that nighttime herbicide application could be useful as an alternate timing when daytime conditions are poor, helping growers avoid the economic and environmental consequences of waiting for ideal daytime conditions. Is applying herbicides at night a practical option for producers? What is the efficacy and tolerance of applying herbicides at night? What are the possible issues or complications with night spraying? and in-crop trials at research plots in three Alberta locations — Lethbridge, Bonnyville and Falher — during the 2012, 2013 and 2014 growing seasons. PSBD trials were sprayed with four different herbicides at label-recommended and three-quarter-label rates and at three different timings: day (noon to 2 p.m.), night (midnight to 1 a.m.) and dawn (4 to 5 a.m.). In-crop trials were sprayed at three-quarter-label rates with nine different herbicides using similar equipment and timings as in the PSBD trials. 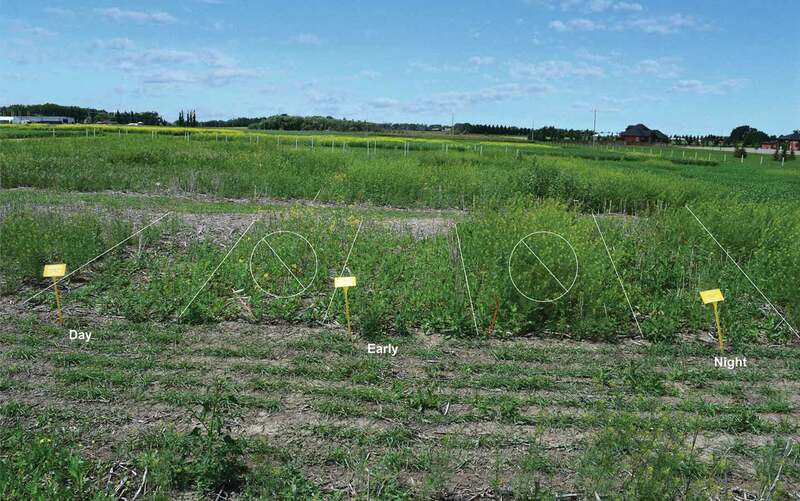 Tame mustard and tame oats were used in this study to simulate broadleaf and grassy weeds. Across all treatments and site years, on average, herbicides were most effective when applied in the daytime, and night spraying gave better results than dawn application. Dawn application was the least effective timing overall. A substantial advantage was observed in both day and night applications over the dawn application. In 2013, heavy rainfall shortly after spraying rendered the herbicides almost totally ineffective in weed kill for the trials that year. However, averaged over all three years, PSBD application in the daytime was still more effective than dawn 75 percent of the time when measured in terms of efficacy rating, and about 67 percent of the time based on weed biomass ratio. When only the 2012 and 2014 results are averaged, those values increase to 94 percent and 75 percent, respectively. Both day and night PSBD applications were concluded to be more effective than dawn application in about 82 percent of the instances in 2012, and 88 percent of the instances in 2014. This suggests night spraying of herbicides is a strong alternative when midday conditions are too hot, windy or dry for optimum treatment. In-crop trials evaluated herbicides for efficacy and crop tolerance in Liberty Link canola (LL), Roundup Ready canola, wheat and peas. Results were consistent with those of the PSBD trials, with day and night applications performing better than dawn applications in about 75 percent of all instances. Tests were also conducted around efficacy of herbicide application timing given the nighttime vertical position of leaves in some weed species. Broadleaf plants that exhibit diurnal leaf movement keep their leaves horizontal relative to the stem with maximum surface area exposed during daylight. However, this leaf-movement phenomenon is not as prevalent in grassy weeds. When the efficacy rating and weed biomass ratio means were averaged over all herbicide and crop treatments, the daytime applications performed better than night and dawn timings in all site years for controlling mustard, a broadleaf weed. However, for oats, a grassy weed, daytime treatment only outperformed night and dawn treatments in 50 percent of the instances in terms of efficiency, and 75 percent of the instances based on weed biomass. All factors considered, the results suggest nighttime application could be employed as an alternative to optimize herbicide use when daytime application opportunities are limited. It may also save farmers money and time through improved efficacy. Night spraying has become a more practical alternative through the evolution and widespread adoption of technology such as GPS guidance and auto-steering systems. Pre-seed and in-crop herbicides provide the most consistent results when applied in the daytime, but avoid early morning applications, because they are the least consistent in efficacy. Consider the type of herbicide, mode of action and weather conditions such as temperature, relative humidity, wind and delta T.